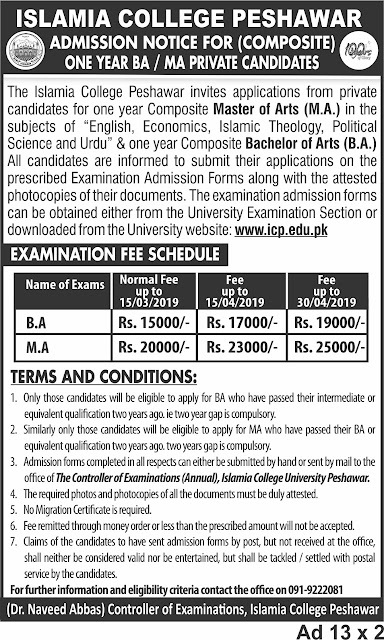 Islamia College University Peshawar announced admissions for one year BA and MA in the fields of English, Economics, Islamic Theology, Political Science and Urdu. Those candidates who have passed their intermediate two years ago are eligible to apply for a composite one year BA. Two years gap is compulsory. Similarly, those candidates who have cleared their BA two years ago are eligible to apply for a composite one year MA as per rules. You can apply online through email as well as conventionally.